It has now been over a week since AMD dropped the bombshell that it would be seeking to acquire ATI in a massive $5.4 billion dollar deal to be closed sometime in Q4 of this year. Regardless of each company's current position in the market, the AMD/ATI merger has the potential to completely re-write the face of competition and a number of markets we cover on a regular basis. It's a tremendous gamble on AMD's part, especially considering that much of the deal is in borrowed cash. Whether this deal ends up being the smartest move AMD ever made or the beginning of the end has yet to be seen, and honestly at this point it's far too early to predict what will come out of it should the acquisition go through. 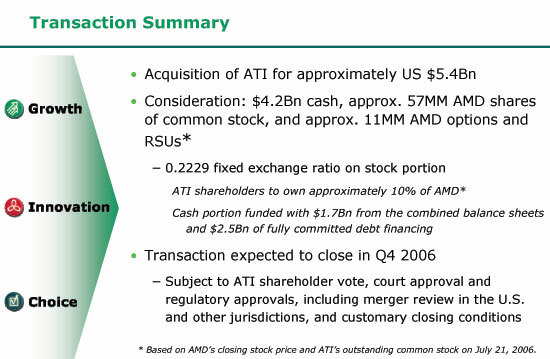 AMD plans on acquiring ATI for a total of $5.4 billion dollars in a mixture of cash and stock. AMD will use $4.2 billion in cash ($1.7 billion currently on hand, and another $2.5 billion borrowed) and 57 million of its shares to pay for the deal. The deal will close in the next 100 - 120 days, finalizing it near the end of 2006. AMD isn't disclosing under what conditions it would walk away from the deal. According to AMD's Hector Ruiz, AMD is partnering with ATI to develop "integrated silicon where it makes sense". AMD has no intention of blocking or prohibiting the sale of ATI products to anyone, but neither AMD nor ATI is counting on things like ATI Intel chipset sales continuing going forward. Current ATI roadmaps over the next 6 months will remain unchanged. ATI's manufacturing arrangement (mainly ATI being a fabless manufacturer) will not change for the next 1 - 2 years. The current production models will remain as-is. AMD doesn't believe that NVIDIA will alter its relationship with AMD; NVIDIA believes the same. Intel has not revoked ATI's bus license and has not made any public changes to its cross-licensing agreements currently in place with AMD and ATI. With the backdrop set, let's kick things off by looking at the merger from AMD's perspective. Hey, why don't we just put FPGA block on the cpu? it was good to just read any sort of article from the site owner. was feeling that the reviews section had just fallen into the depths of fanboyism, so it was good just to hear somebody at least sometimes impartial THINKING out loud rather than just showing off. what's really interesting to me is that the whole article mimics what was written in the latest (i think) issue of cpu from selfsame author. Doesn't AMD have a co-op of some sort w/ IBM? I thought you guys already knew this, but apparently not. Most likely, there will be no Fab 30, it will be re-equipped to be Fab 38, 300 mm with 65 nm features. of the 5.4b of ATI's purchase price, is most of that due to intellectual property? i mean as you state, ATI has no fabs. and then regarding the future of GPU's, with CPU's now becoming more and more multithreaded, couldnt it be fathomable that some of the work be moved back to the cpu in order to fill that workload? I had to register just to say well written article. It has provided me with much more information regarding the merger than any other website. How is the GPU on a CPU even considered a good idea by anyone? GPU bandwidth + CPU Bandwith = how the hell are mobo bus's and chipset going to handle all that competing bandwidth from one socket. Either way their is crazy amount of conflicting bandwidth from one socket, I doubt it can be done without serious thrashing penalties. Call me crazy, but that sounds like an April fools joke. But who's kidding who? Considering that we have the potential for dual socket motherboards with a GPU in the second socket, of a "mostly GPU CPU" in the second socket, GPU on CPU isn't terrible. Look at Montecito: 1.7 billion transistors on a CPU. A couple more process transitions and that figure will be common for the desktop CPUs. 1. There was no mention of the channel in this article, which is the vehicle by which most of these products make it to market. Intel and Nvidia have a leg up on any newly formed ATI/AMD entity, in that they make sure their partners make money and are doing more and more to reward them for supporting their platforms. AMD has been somewhat confused lately, trying to keep their promises to their partners while trying to meet sales goals on the other. 2. Intel and Nvidia could ramp up their partnership a whole lot quicker than AMD/ATI can (no pesky merger and integrating cultures to worry about), so now you have Nvidia with a long term, very gradual share shift on the AMD side with a quicker ramp up on the Intel side of things to replace ATI's share. Intel and Nvidia in the short term end up doing pretty well, with plenty of time to develop next gen platforms to compete with whatever the long term AMD/ATI roadmap looks like. This will be the end of AMD and ATI as we know them today....and the end of both in the high end enthusiasts market...when merged; the new company will be nothing more than a mediocre company both of which will lag behind Intel and NVIDIA in performance.